Kidney Cancer is the eighth most common cancer in the UK with more than 10,000 new cases diagnosed every year. Today, most patients have no symptoms at all and are diagnosed by chance following scans often for unrelated medical problems. In some patients however, kidney cancers can lead to blood in the urine (haematuria), pain in the back/loin, weight loss, fever, sweats, tiredness or even a lump in the belly. The reason people develop kidney cancer is not fully understood. People with certain risk factors appear to be more likely than others to develop kidney cancer. The most common risk factors associated with kidney cancer are smoking, obesity and high blood pressure. People who have a family member who had kidney cancer also have a slightly increased risk of the disease. The kidneys can be assessed using ultrasound, CT or MRI scans. Kidney cancers appear as abnormal masses or lumps on a scan. 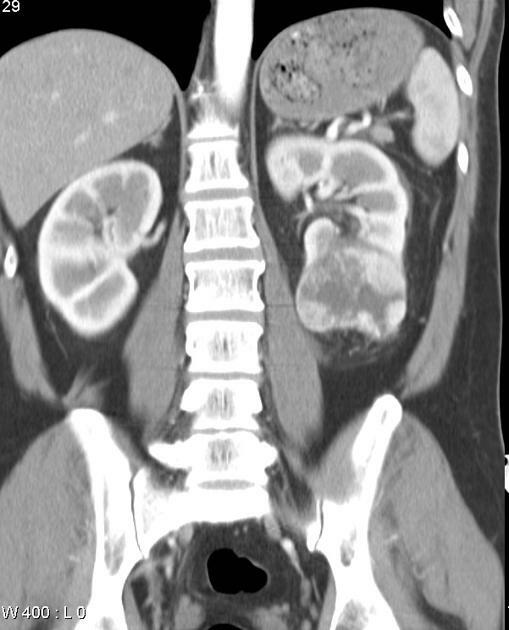 CT scans with the use of contrast into the vein are regarded as the best way to evaluate the kidneys for kidney cancers. Anybody with a scan suggestive of a kidney cancer should also have a staging CT scan of the chest and abdomen to look for potential cancer spread. The most commonly diagnosed kidney cancer is a small renal mass. This is a lump/mass on the kidney that is less than 4cm is size. Overall, approximately 80% of small renal masses are malignant and 20% benign. In some cases, a biopsy of thee small renal mass is recommended to help make a diagnosis kidney cancer. Kidney biopsies are performed using a thin needle through your skin into the kidney to remove a small sample of tissue with the help of use ultrasound or a CT scan. The biopsy specimen is then analysed by a pathologist to check for the presence of any kidney cancer cells. The best treatment option for patients diagnosed with kidney cancer is highly personalized. Treatment decisions are based upon numerous factors including; the size of the tumor, position of the tumour within the kidney, presence of spread of the cancer to other parts of the body, presence of other medical problems and overall fitness. Surgery is the main way of treating kidney cancers that have not spread to other parts of the body. For patients with cancers less than 7cm in size, where possible the best treatment is a partial nephrectomy. This operation aims to remove the cancerous lump/mass without removing the whole of the affected kidney. Some tumours however are not suitable for a partial nephrectomy, and in this situation the whole kidney needs to be removed in an operation called a radical nephrectomy. Surgery for kidney cancers affecting only the kidney can result in an excellent chance of cure. “Robotic” Surgery involves the use of the Da Vinci Si surgical platform. This is a state of the art surgical robot that allow the surgeon to perform minimally invasive surgery with the aid of 3D High Definition vision and highly advanced instruments. 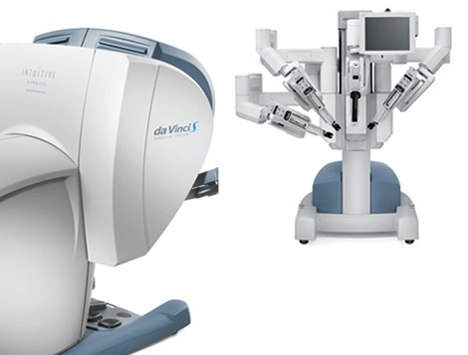 The Da Vinci robot can used to perform a Partial Nephrectomy through 4 or 5 small incisions. A robotic partial nephrectomy is less painful, and results in a shorter hospital stay and most importantly leads to a speedier overall recovery following surgery. Laparoscopic or “key hole” surgery involves the use of a High Definition camera and special instruments introduced through small ports in the abdomen. This technology allows the surgeon to see and operate inside the body without the need for a large surgical incision. Laparoscopic surgery is used most commonly to perform radical nephrectomy. Here the surgery is performed through 4-5 cuts 1-2cms in size. The kidney is eventually placed in a special bag and removed through a small incision in the groin. Laparoscopic surgery is less painful, is associated with less blood loss, a shorter hospital stay and a quicker return to normal activity. Open surgery on the kidney is usually performed through an incision just under the ribs. Complicated kidney cancers needing a partial nephrectomy, very large kidney cancers or those involving the renal vein or inferior vena cava are best managed with an open operation. Most patients are home within 5 to 7 days. A small number of people have only one functioning kidney either because they were born that way or as a result of previous surgery/cancer. 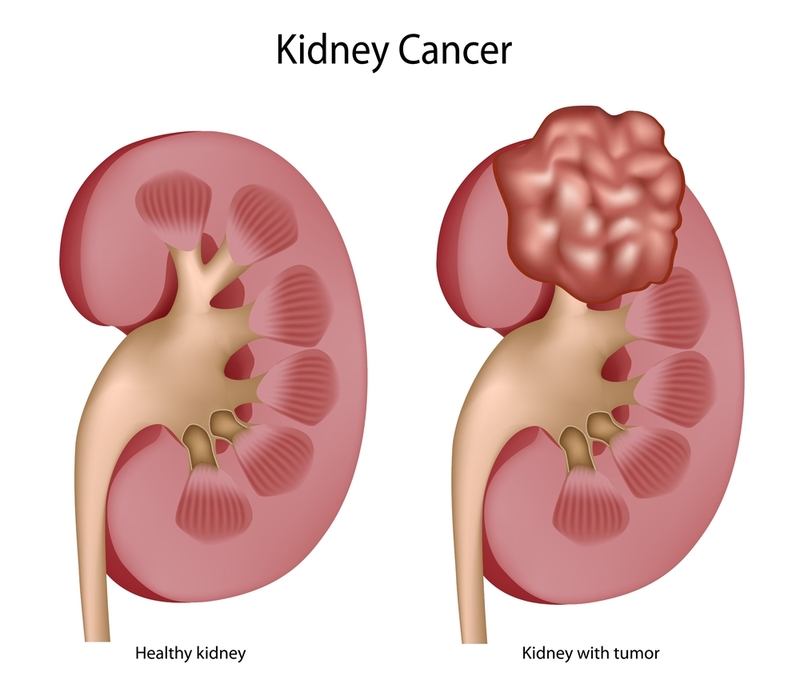 When a cancer is found in people with a single kidney, most can safely have a partial nephrectomy to remove the cancer and keep enough kidney function to avoid dialysis. In some circumstances however the kidney cancers are too large or positioned in a place where a normal partial nephrectomy is not possible. These people can be managed with an ex-vivo partial nephrectomy and renal auto-transplantation. This operation involves complete removal of the affected kidney which can be done open or laparoscopically. The kidney is then flushed out and cooled on a bed of ice. The kidney cancer is carefully removed and the kidney reconstructed. The kidney can then be transplanted back into the patient. This highly complex surgery offers an excellent chance of cancer cure and also allows patients to avoid dialysis. The team in Oxford are the national referral centre for this operation in the UK. Small renal masses under 4cm in size are the most commonly detected form of kidney cancer. These cancers tend to grow slowly and appear to have a low risk of spreading to other parts of the body. Some patients diagnosed with a small renal mass can safely be managed by regular observation/active surveillance. This involves repeated scans to monitor the kidney cancer. Some cancers can grow quickly and these may subsequently need surgery or ablation. Some small kidney cancers less than 4cm in size can be effectively managed with ablation. In this treatment a thin needle probe is placed into the cancer with the aid of a CT scanner. Microwave energy is then delivered to the kidney cancer and the heat destroys any cancer cells without damaging the rest of the kidney. This minimally invasive procedure usually involves an single night stay in hospital. Some kidney cancers can spread to other parts of the body. In these circumstances chemotherapy using drugs such as Sunitinib and Pazopanib can be used to treat the disease. These drugs are given by Medical Oncology Specialists.